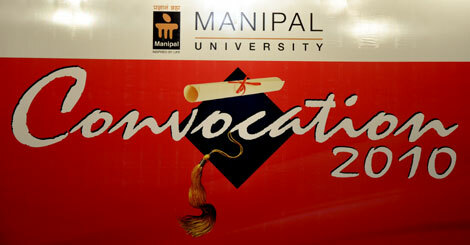 There are only a few hours remaining for the Convocation 2010 at Manipal University. All the Staff, Students and Graduates of the University are eagerly anticipating the arrival of the President of India, Mrs. Pratibha Devisingh Patil in a few hours. She will be arriving at about 04.45 pm from Mangalore, a special Helicopter will drop her off at the newly constructed helipad in the Manipal Football stadium near the End Point. 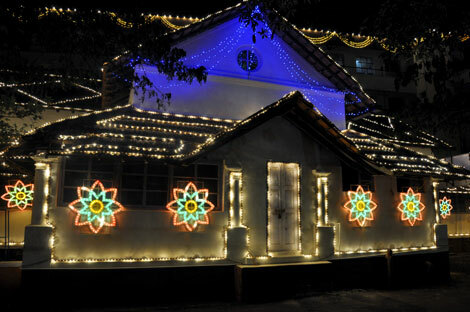 Indications are that she will then be whisked away to the Hotel Valley View within the Manipal campus for tea, on the way passing the newly constructed multi-speciality MARENA sports complex. She will then be accompanied by the Manipal University Chancellor, Dr. Ramdas Pai, the Vice-chancellor and the Registrar to the KMC Greens for the Convocation function scheduled to begin at 7:00 PM in the evening. She will participate in the 10th convocation of Manipal University and will confer PhDs on 29 candidates and gold medals on 13 meritorious students. All preparations are complete and everyone is eagerly awaiting the arrival of the President of India to Manipal University. The convocation can be viewed live at http://webex.wstream.net/manipal/101208 and also at http://www.manipal.edu/NewsRoom/Pages/EventsDetails.aspx?EventsID=26. Manipal University has banned the use of Mobile Phones and Cameras during the event, except for individuals with a press card, so this is the only option to see the convocation, if you are not among the invitees.